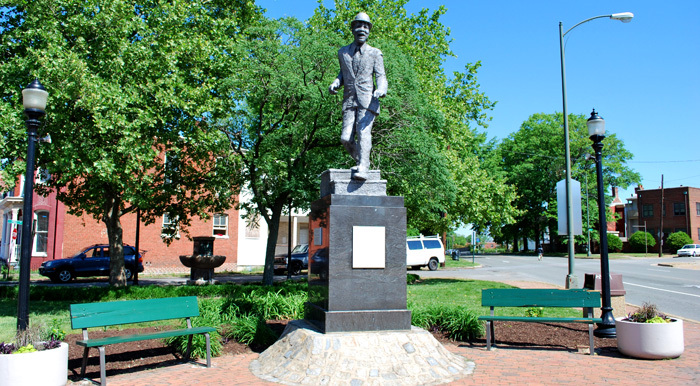 WHAT: Statue to Bill Bojangles Robinson in Jackson Ward in downtown Richmond, Virginia. LOCATION: At the intersection of old Brook Road, West Leigh and Price streets, in the south corner of the triangular Bojangles Park. DESCRIPTION: This 9 1/2 ft. aluminum figure of the famous tap dancer Bill “Bojangles” Robinson stands on a 6 foot high black marble pedestal. The Statue portrays Bojangles dancing down a flight of stairs. It is sponsored by the Astoria Beneficial Club. Bill “Bojangles” Robinson was born May 25, 1878, in Richmond. He was an American tap dancer and actor of stage and film. Audiences enjoyed his understated style, which eschewed the frenetic manner of the jitterbug in favor of cool and reserve; rarely did he use his upper body, relying instead on busy, inventive feet and an expressive face. A figure in both the Black and White entertainment worlds of his era he is best known today for his dancing with Shirley Temple in a series of films during the 1930s. He died of heart failure, penniless in New York City, November 25, 1949. Sadly, Bojangles Park is very small and the streets are busy at this intersection. I love this setting and the statue itself, but it’s tough to enjoy the scene with visitors and small children without worrying about traffic. Of course, that’s part of why he’s honored. The story goes that in 1933, while in Richmond, he saw two children risk speeding traffic to cross a street because there was no stoplight at the intersection. Robinson went to the city and provided the money to have one installed. The triangle park is well-maintained, as is much of the architecturally intriguing Jackson Ward these days. So many renovated homes and old buildings are being brought back to life. The park also includes an old animal drinking fountain, which I find to be fascinating in its own right. I wish that many more of those existed around the city as an attractive link to the past. 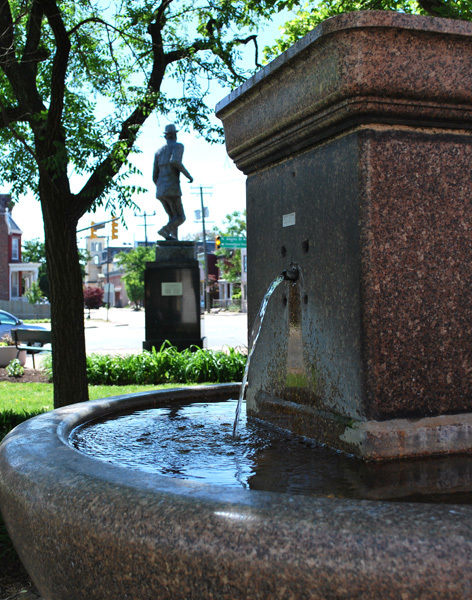 It’s easy to envision someone with a horse carriage taking advantage of a fountain like this one on a “long” trip from downtown Richmond to Ginter Park and the North Side 100 years ago. WHAT: ‘Headman’ on Brown’s Island in downtown Richmond, Virginia. LOCATION: Brown’s Island near the foot of the bridge over the Haxall Canal at the of 7th Street. DEDICATION: Nov. 25, 1993 (bronze statue). DESCRIPTION: The 9 1/2 foot tall bronze sculpture commemorates the contributions of the black boatman on the James River. His two arms are holding an oar and his head looks to his side over his shoulder. The boat is made of cypress and oak and his hands are attached to a wooden oar. Brown’s Island is one of the most essential outdoor party places in downtown Richmond, and Headman is there to welcome visitors to at the bottom of the staircase as they cross the long footbridge to enter the island. The vistas from Brown’s Island of the downtown skyline, the James River, CSX train viaduct and the many other man-made structures makes this a great place to unwind. Big events like the Richmond Folk Festival & Friday Cheers. All the summer food & music festivals, adventure games, car shows — down to the daily lunchtime walkers — all of it. Since the first time I noticed the boatman, I always take a few moments to see how he’s doing. The original fiberglass version of ‘Headman’ was stolen away in 1989 to Hanover County, shot full of holes and vandalized. The current bronze statue was dedicated in 1993 and has held down the fort at Brown’s Island ever since. I think the city does a great job of making wonderful little places like this for people to see the diverse history of this old town. I helped bring Oliver A. Scott and Edloe B. Scott back to life. 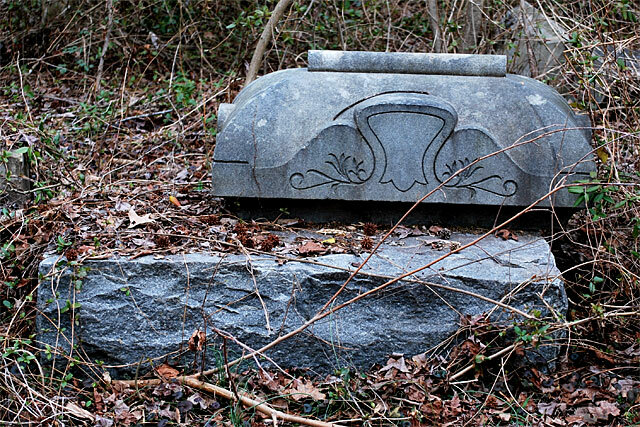 Not really, but their burial plots at Evergreen Cemetery are at least once again free from the shackles of garbage, ivy, broken trees and ravages of Mother Nature reclaiming a forgotten landscape. 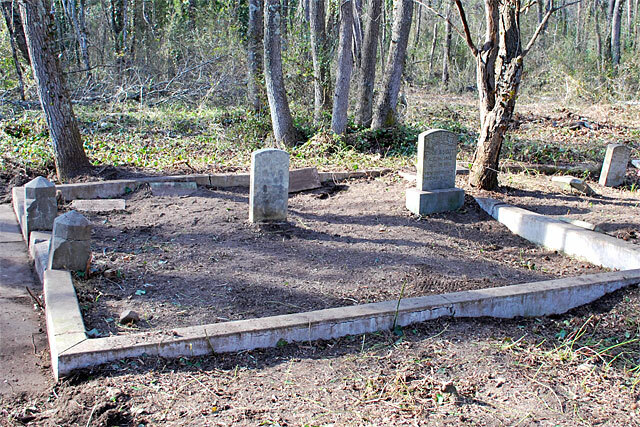 It took at least four hours of work, but a group of volunteers and I worked to reclaim the lost cemetery. 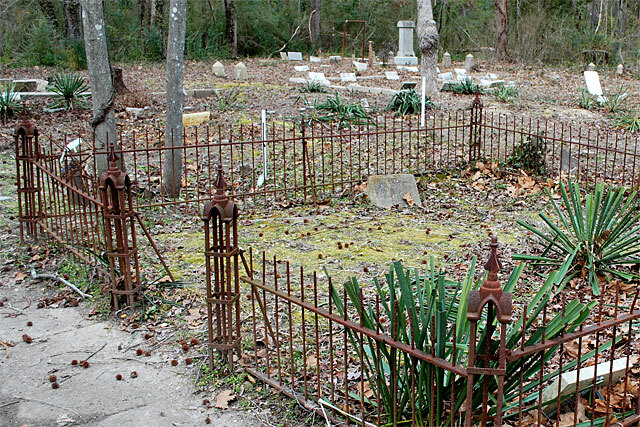 It is a daunting task to completely remove more than half a century of neglect, but rewarding. 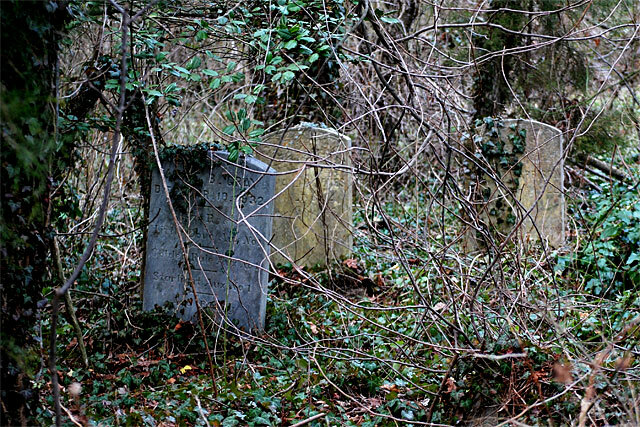 This kind of work needs to be delicate so as not to disturb the graves — you can’t just clear-cut the entire landscape. 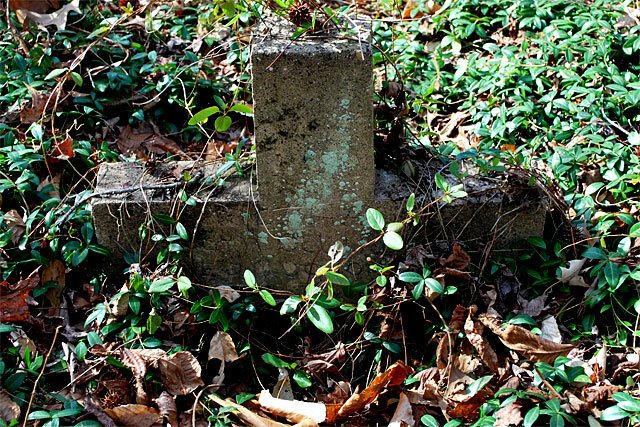 Formed in 1891 in Richmond’s East End, the express purpose of the Evergreen Cemetery Association was to establish a black cemetery that would rival Hollywood Cemetery. 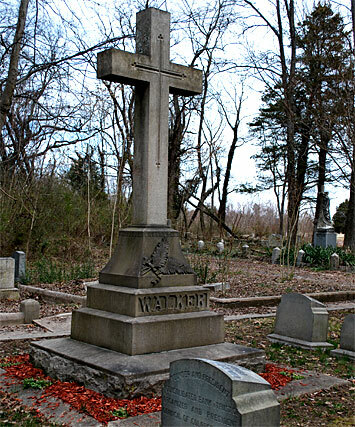 It became the final resting place of many of Richmond’s leading African-American citizens, including Maggie Lena Walker, John Mitchell, Jr., and Rev. Andrew Bowler. 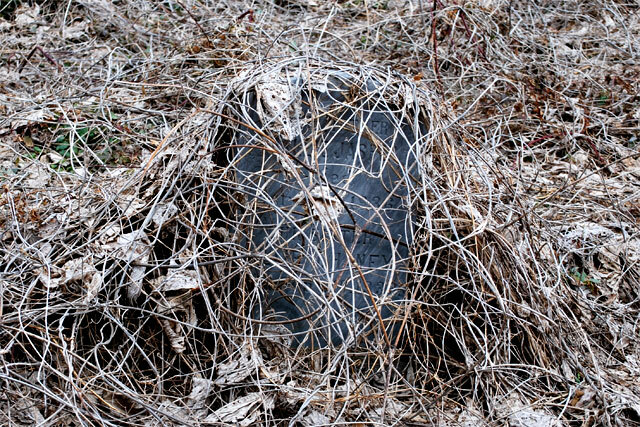 Opened with no means for perpetual care, the cemetery has been left unchecked and is overgrown by trees, ivy (poison and English) and weeds. It has also been terribly vandalized and is littered with dumped garbage. 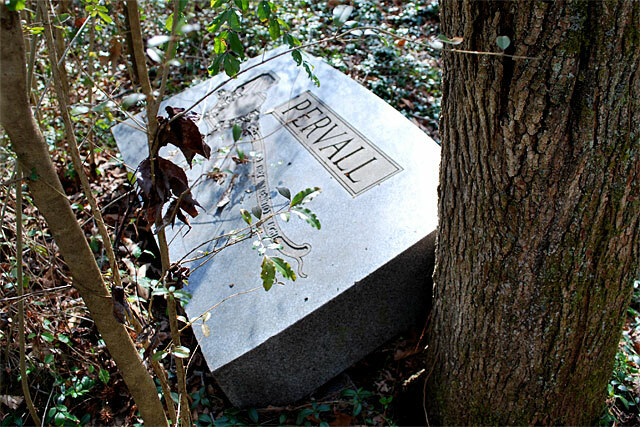 The regular volunteers got there start in Summer 2008 when they took the challenge to search for the grave of Pearl Williams. What is has become is a quest to find another several thousand lost sites, one by one. One of the main organizers, John Shuck, called the effort an archeological dig, landscape clearing and genealogical search all in one. I agree. As we worked, I got the feeling that I was resurrecting history — reclaiming something beautiful and valuable that had been lost. I met a wonderfully delightful and invested 12-year-old boy, Noah (green jacket, above), who comes out with his father, Mike, every weekend. Noah was quite experienced with encouraging and guiding volunteers on what needed to be done and helping set goals within a three-hour work time frame. 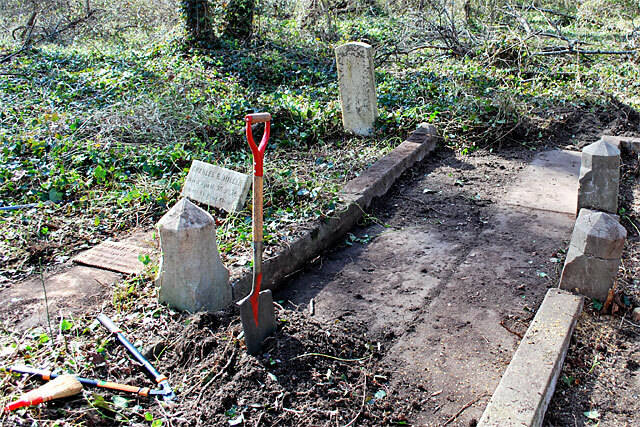 We picked a plot that had a suspected path next to it and by the end of the day the group had cleared two and a half plots and uncovered the path. Envisioning a goal and attacking it. Plus, the conversation was uplifting and positive — a great environment for giving your time for a good cause. 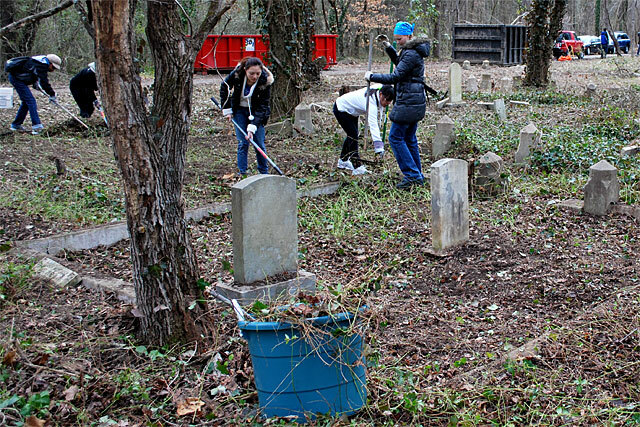 Clearing the cemetery will take years, and the small core of volunteers needs your help. Rally your friends and family and give three hours of your time one Saturday morning. Get a troop together. As you can see at right, we got a lot accomplished in one day. Compare it with the photo at top, which was after about an hours work. I was given a tour of a forgotten land. It would have been more encouraging if it had been in a Central American jungle and we were looking for the ruins of a Mayan temple. No, it was Richmond, and we were seeking the ruins of what was supposed to be a symbol of blacks finding a measure of equality. [It] was created in 1891. 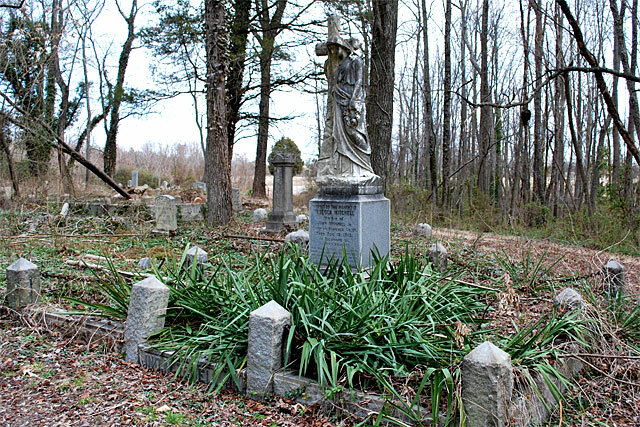 It was laid out by the Evergreen Cemetery Association on a high ridge overlooking the valley formed by Stony Run and Gillies Creek; it was planned to be the African American equivalent of Richmond’s high-style Hollywood Cemetery for whites. 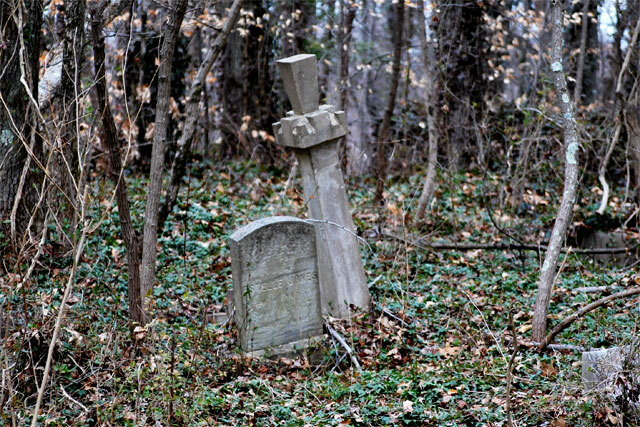 From below, dense woods obscure the effect of the massed monuments on its hillside, and the historic gravestones extend deep into the woods, where the dead are forgotten amid overgrown paths, upturned monuments and anonymous graves. 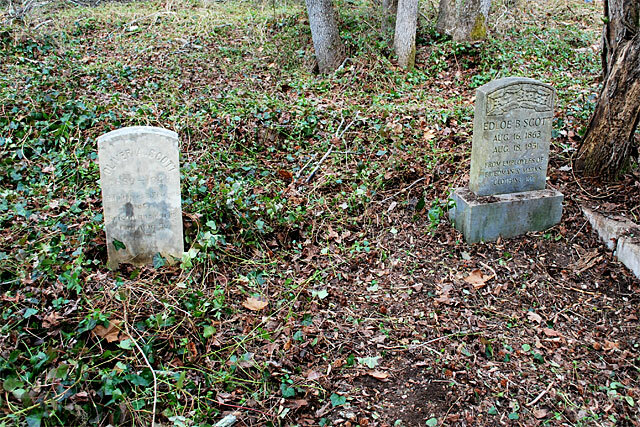 It became the final resting place of many of Richmond’s leading African-American citizens, including Maggie Lena Walker and John Mitchell, Jr. Their plots and the surrounding plots are cleared, though roughly. There are thousands that aren’t, many forever lost. The message that Evergreen first broadcast, that of parity and permanence, has become defused and blunted. 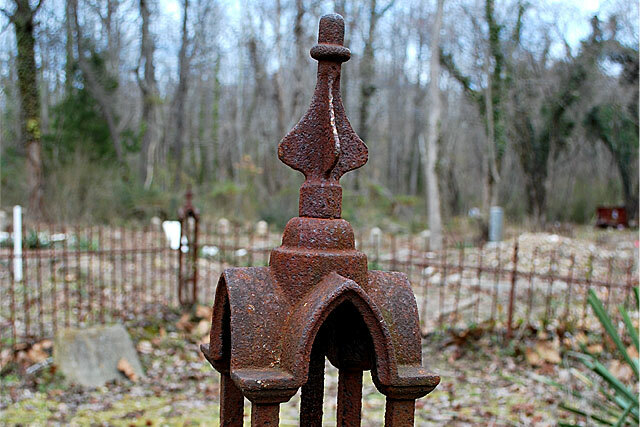 The neglected cemetery distresses and confuses its few visitors, and the architecture of what was intended to be a memorial park can affect those who enter it. 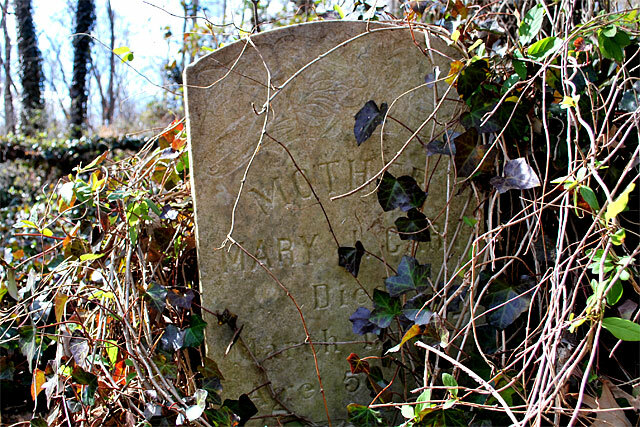 Read Built by Blacks or Here I Lay My Burdens Down: A History of the Black Cemeteries of Richmond, Virginia by Veronica Davis. 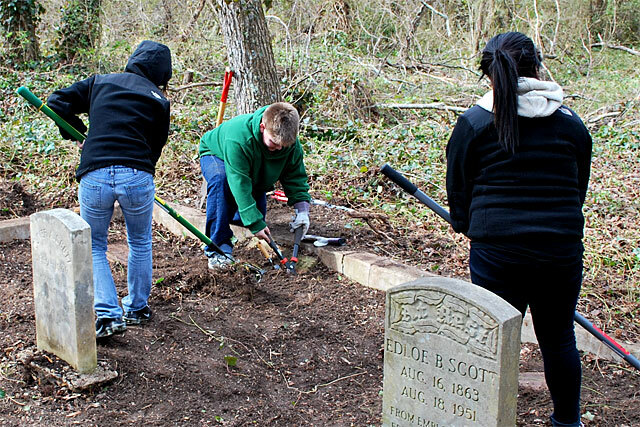 Gather your friends and do something about the cemetery. WHAT: Virginia Civil Rights Memorial at the Virginia State Capitol in Richmond, Va. See and listen to a slideshow. LOCATION: Capitol Square, Northeast Corner near Governor Street entrance. DESCRIPTION: Cast in bronze, the 18 figures are slightly larger than life. The wall the statues back up to is 12 feet long, 8 feet high and about 5 feet wide. The $2.6 million granite and bronze memorial was privately financed. A Commonwealth once synonymous with defiance of court-ordered school integration celebrated the latest symbol of its often-difficult embrace of equality with the Virginia Civil Rights Memorial in 2008. 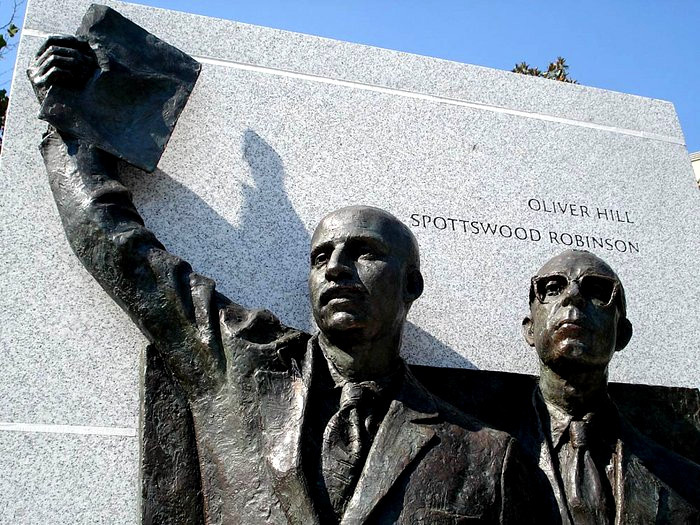 It represents a key moment in the history of the civil-rights movement in Virginia. The statue spotlights the African-American students in rural Prince Edward County whose 1951 walkout to protest their run-down school led to a lawsuit that was folded into the challenge that triggered the 1954 Brown vs. the Board of Education decision by the U.S. Supreme Court banning segregated public schools. Among the figures in the memorial is Oliver W. Hill Sr. holding a rumpled legal brief aloft as he stands shoulder to shoulder with law partner Spottswood W. Robinson III. They took on the case of the Prince Edward County students who protested the shabby condition of their school. 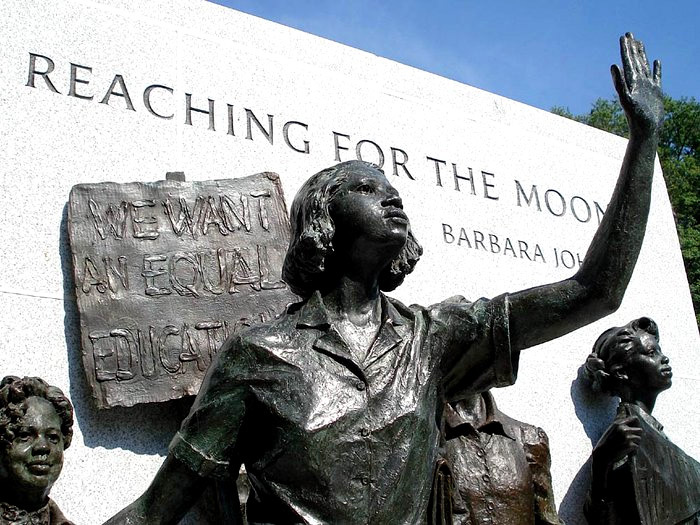 Barbara Johns was the one who called the school strike in 1951 and she is a key figure in the sculpture. 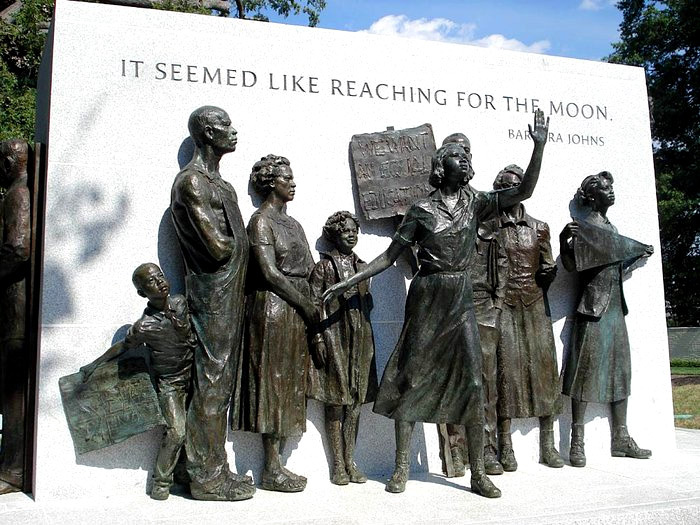 Her statement “it seemed like reaching for the moon” is boldly featured. The student protests garnered support from the local community, benefiting from the moral leadership of the Rev. L. Francis Griffin, known as the “Fighting Preacher” and is also featured in the memorial. On April 23, 1951, 16-year-old Barbara Johns and several fellow students led a strike to protest the deplorable conditions at their racially segregated Prince Edward County school. The Rev. L. Francis Griffin united parents in support of the strike and encouraged the students to contact NAACP attorneys Oliver Hill and Spottswood Robinson. The lawsuit that followed was brought before the U.S. Supreme Court and joined with four other cases as Brown v. Board of Education of Topeka (1954), in which the Court ruled that racially separate educational systems are inherently unequal and unconstitutional. This memorial is dedicated to these Virginians and countless others who courageously fought for the principles upon which the nation and this Commonwealth were founded. WHAT: Richmond Slavery Reconciliation statue. LOCATION: 15th and East Main streets. 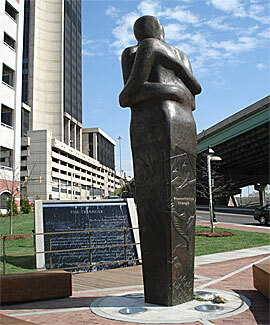 DESCRIPTION: The 15-foot, half-ton bronze sculpture — depicting two people melded in an embrace — was erected not far from Richmond’s former slave market in Shockoe Bottom. There are three large wood block benches that triangulate the statue and a cascading fountain with captions describing the significance of the statue. Richmond, Virginia During the 18th Century, these three places reflected on of the well-known triangles in the trade of enslaved Africans. Men, women and children were captured in West and Central Africa and transported from Benin and other countries. They were chained, herded, loaded on ships built in England and transported through the unspeakable horrors of the Middle Passage. They were imported and exported in Richmond, Virginia and sold in other American cities. Their forced labor laid the economic foundation of this nation. I was there the day of the unveiling of the statue and checked in from time to time the next week or so. After initially being concerned that someone might defile the statue, I was impressed that even little burning candles and flowers left at the base of the statue were left alone. I haven’t been a Richmonder for most of the significant statues, so it felt good to be an observer during this process of building another stop along the Richmond Slave Trail. I still stop there on occasion, and I appreciate the message of this statue, and the significance of the trail itself. WHERE: Monument Avenue and Roseneath Road. DEDICATION: July 10, 1996 (it would have been his 53rd birthday). DESCRIPTION: The bronze statue of Arthur Ashe faces west with four children facing east. The statue shows him holding books in his left hand and a tennis racket in his right hand to illustrate how he encouraged the importance of sports and education. 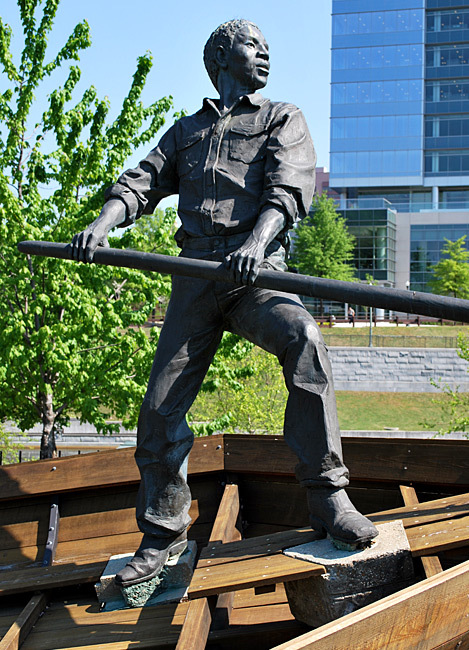 The 12 foot bronze statue (the figure is 10 foot tall, 12 foot to the books in his left hand) stands on a 87,000 pound granite block quarried in Georgia. The monument rises 28 feet above the street. Should it be on Monument Avenue with all the Confederate heroes? Should there be more design options? Is the base too big for the statue? Is he about to hit the kids with the books and the racquet? Personally, I don’t think it is the best statue in Richmond. That’s no slight to Mr. Ashe, who was and still is a hero to so many people worldwide. 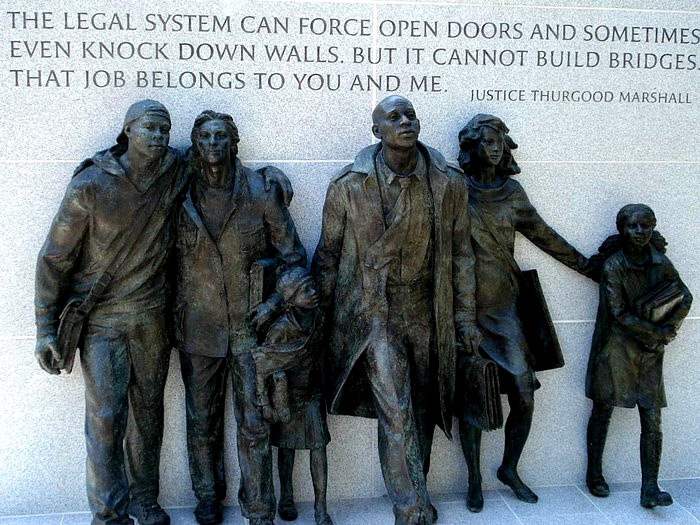 The message in the statue is a good one, and true to his legacy. He’s kept a smile over on Monument Avenue. Who remembers that then Mayor Leonidas Young had a proposal to place the monument in Byrd Park and rename the Boulevard for Arthur Ashe? Definitely, there were some that thought his statue belonged in Byrd Park, home of some of his tennis-playing days as a Richmond youth. One article in the Richmond Times-Dispatch noted a suggestion from a city council member to move the Stonewall Jackson monument to make way for Ashe, calling the intersection of Monument Avenue and Boulevard “the most primary piece of property in the city.” I’ve written that it is the most trafficked and therefore most visible on Monument Avenue. 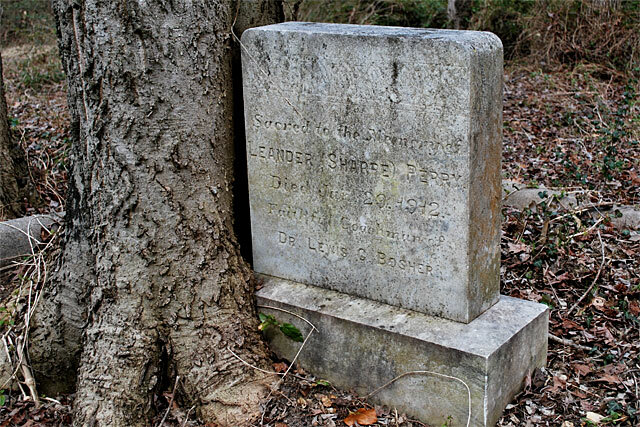 The article also noted that the entire Ashe family favored the site at Monument Avenue and Roseneath Road — and that Arthur would not have approved of the debate over the location for the statue. How else has Richmond honored Ashe? Have you ever seen the Arthur Ashe Center? I’ve never liked the building, and I’m not alone. One day Richmond will tear that down and build a more adequate and modern facility to replace it. There have been proposals, mostly tied in with revamping The Boulevard corridor and The Diamond, located on the same property. I hope that if it gets Ashe’s name, it will at least be worthy of his world-class status.